Miacomet Dreaming (2008) for orchestra is dedicated to Loretta Yoder and Kyle Latshaw. 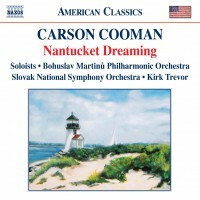 The title refers to Miacomet, a region of Nantucket Island, Massachusetts. This work is one of a variety of pieces deeply connected to the landscape of Nantucket. The inspiration for the work was an oil painting, Path to Miacomet (2006), by Loretta Yoder; its fervency of color and landscape provided the poetic image that drives the work. The music itself was worked out during a the early hours of darkness on the actual beach of Miacomet. As the sun set, and darkness covered the landscape, only the passionate sound of the surf remained. The music is fervent and searching in tone. It begins with a roar before quieting down to introduce its basic musical material—a simple “lament-like” theme in a folk-inflected style. This material is used for further explorations, building to passionate climaxes. Finally, the opening music returns, but this time it is whispered. The movement winds down to a distant and reposed conclusion.